Sanctum have been making 100% natural skin care since 1992, reformulating their entire range to certified organic status in 2006. Having witnessed first-hand the ‘chemical’ side of the industry while running a manufacturing business in Sydney, the founders Greg and Jicky Milham were determined to produce a range of products that remained true to their promise of ‘natural’, with meaningful levels of active ingredients that really worked. Greg combined locally sourced ingredients with therapeutic levels of active herbal and plant extracts, essentials oils and vitamins. The result is the Sanctum range of skin care, body care and hair care treatments, that take the efficacy of all-natural certified organic preparations to incredible new levels. 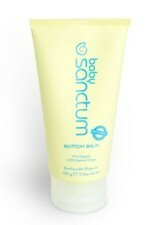 Sanctum Organic Baby Bottom Balm (150ml). A healing balm that assists in preventing nappy rash while also providing relief from redness and irritation with its soothing and calming properties. For use with all babies after bathing, on a daily basis. Certified Organic 91% and 100% Naturally Derived. Sanctum Organic Baby Essentials Travel Pack containing: 1 x Sanctum Organic Baby Shampoo & Wash (30ml), 1 x Sanctum Organic Baby Moisturiser (30ml), 1 x Sanctum Organic Baby Bottom Balm (30ml). This smaller pack, designed for travel, is also a perfect way for new customers to test Sanctum's Baby product range. 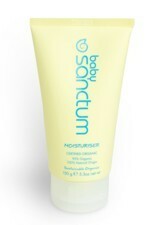 Sanctum Organic Baby Moisturiser (150ml). A light daily moisturiser to hydrate, soothe and protect the baby’s skin. The moisturiser aids in soothing and protecting the baby’s skin by nourishing and locking in moisture. The Aloe Vera and Shea Butter repair already irritated skin. Certified Organic 95% and 100% Naturally Derived. 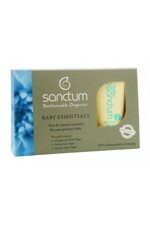 Sanctum Organic Baby Shampoo & Body Wash (150ml). Sanctum's Baby Shampoo & Wash, formally two separate products, has now been reformulated as a 2 in 1 baby product. The simplified light foaming gel is infused with lavender and Sweet Marjoram Leaf Oil to help calm the baby and also soothe the scalp. Certified Organic 91% and 100% Naturally Derived. 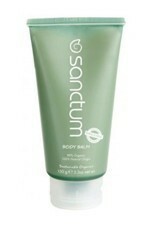 Sanctum Organic Body Balm (150ml). Help rid your body of dry, flaky skin with this hydrating cream rich in luxurious Shea Butter and Coconut Oil. Quick to absorb, it deeply replenishes lost moisture to help you achieve a super smooth, supple complexion. Certified Organic 89% and 100% Naturally Derived. Sanctum Organic Body Buff (200ml). This invigorating body scrub gently exfoliates to remove dry skin and ingrained impurities. Your body will feel fresh and awakened. Certified Organic 86% and 100% Naturally Derived. Sanctum Organic Body Essentials Travel Pack containing: 1 x Sanctum Organic Body Buff (30ml), 1 x Sanctum Organic Body Balm (30ml), 1 x Sanctum Organic Hand & Nail Repair (30ml). This smaller pack, designed for travel, is also a perfect way for new customers to test Sanctum Body care product range. 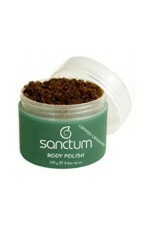 Sanctum Organic Body Polish (250g). Polish your way to perfection with this ultimate shower partner. The unique, gentle infusion of Salt, ground Coffee and crushed Macadamia Nut Shells will effectively remove dead skin cells and help improve circulation. Immerse yourself in the lush, calming aroma of sweet coffee and reveal your smoother side. Certified Organic 95% and 100% Naturally Derived. 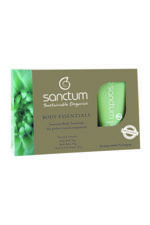 Sanctum Organic Body Soothe (200ml). For all over body hydration spoil yourself with this light, nourishing lotion. Absorbs quickly into the skin for instant hydration. Locks in moisture for a radiant, natural glow. 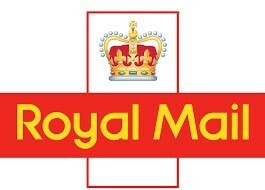 Certified Organic 90% and 100% Naturally Derived. Sanctum Organic Body Spa (200ml).The ultimate skin softening shower gel. Builds into a light, creamy lather cleansing and rejuvenating the skin. Turn your bath or shower into a luxurious treat. Certified Organic 91% and 100% Naturally Derived.